Red finches can be a welcome addition to bird feeders, but identifying house finches and purple finches can be a challenge even for experienced birders. Both species have attractive brown and red plumage, but they look so similar that careful observation and practice is necessary to confidently tell these two birds apart. When watching these brown and red finches, studying details of their appearance and behavior can help birders determine which bird is which. Body Shape: House finches are typically more slender than purple finches, which often look stocky with a larger head and thicker neck in proportion to their body size. Body shape can be distorted by a bird's posture and movement, however, so it is important to observe birds in a casual perch pose to accurately determine shape. 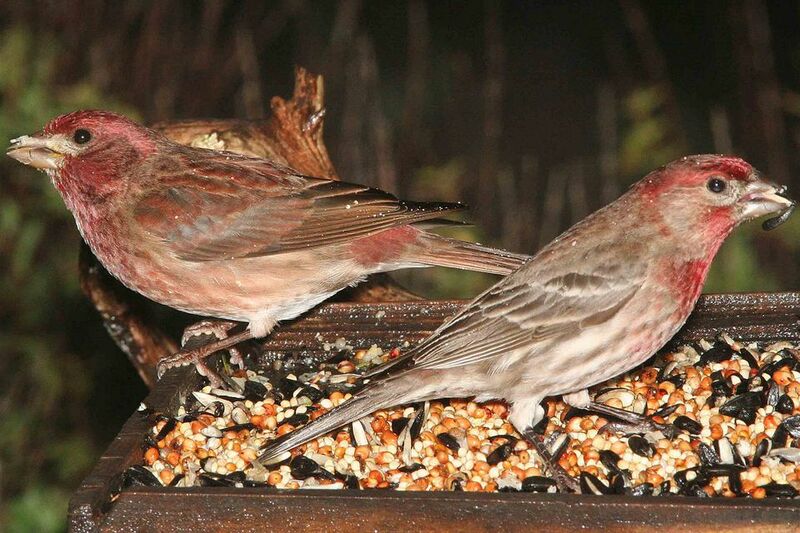 Overall, purple finches are slightly larger than house finches, but if the birds are seen at different distances, size can also be hard to judge. Plumage Color: The males of both these finches are red and brown, but there are many different shades of red. House finches are a classic red or red-orange like a ripe strawberry, while purple finches are more of a dark pink or rosy hue similar to a raspberry or red wine. Purple finches also have much more extensive red extending on the crown, nape, back, chest, and flanks. The red on house finches is more confined to the forehead, brow, and upper chest. House finches can also show orange or yellow color variants, while similar variants are very rare in purple finches. Markings: The sharpness of the markings is key for distinguishing these female finches. Female house finches have blurry streaks on their underparts and a relatively plain face. Female purple finches, meanwhile, have sharply defined streaks and a well-marked face with a distinct whitish eyebrow and fine streaks on the crown. For both genders, house finches have streaked undertail coverts while purple finches are plain white underneath their tails. Wings: When perched, house finches show two thin white wing bars, while the thin wing bars on purple finches have a rosy or red wash. The primary feather projection, or how far the primary feathers reach past the end of the secondary feathers of folded wings, on house finches is shorter than on purple finches. Tail: House finches have a longer tail than purple finches, but only show a faint notch that is not always visible. Purple finches have shorter tails with a much more distinct notch. Tail notches can be seen on perched birds but are not always easy to compare. Bill: Both of these seed-eating birds have similar bills, but the house finch's bill is slightly smaller and has a more distinct curve on the upper mandible, giving it a more bulbous shape. The purple finch's bill is larger with less of a curve, giving it a more classical triangular shape. Range: While these finches' ranges do overlap, knowing the ranges for each species can help with identification. House finches are found in the continental United States and along the Canadian border year-round, and they do not typically migrate. Purple finches prefer a more northern range from Canada's boreal forests in the summer to the continental United States in the winter, but they are absent from the western plains and Rocky Mountain regions. Year-round purple finch populations can be found along the Pacific coast, in the northeastern United States, and in the Great Lakes region. These areas are where the most confusion between these species is likely to occur. Sounds: Both house finches and purple finches have similar songs, but their call notes are markedly different and can be useful for identification. The house finch has a louder, longer "chirp" call with a rising pitch, while the purple finch's call is a soft "pik" sound. While house and purple finches have a lot of similarities, there are enough subtle differences between the species that they can be positively identified with patience and practice. Both these small birds can be active and hard to observe closely to note subtle differences in shape, color, or plumage. When the birds appear, observing several birds in the flock from different angles can give birders a better view of the necessary characteristics for a positive identification. This can be easy if the finches are attracted to bird feeders, giving birders good opportunities to watch them more closely. At the same time, it is important to remember that a conclusive identification isn't always possible. Over time, however, even novice birders can develop a familiarity with these birds that will help them identify each species confidently. Call Note Rising "chirp" Soft "pik"